Is Now the Worst Time to Buy Stocks? Could a recent Barron's article serve as the canary in the coal mine for investors? The article suggested that investing in the stock market right now would be akin to investing just before many of the past's bubbles burst (1974, 1987, 2001, and 2008). Are these fears justified? As I examine the question, my Foolish answer is a nuanced: "Yes, but..."
There are two metrics I use to help take the market's temperature. The first is the "cyclically adjusted price-to-earnings ratio," or CAPE. Yale economics professor Robert Shiller -- who correctly called both the dot-com and housing bubbles -- designed the metric. Instead of just using the past 12 months, CAPE takes into account the inflation-adjusted earnings of the past 10 years. 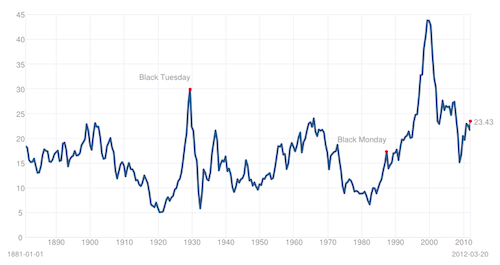 Here's what the market's CAPE has looked like since 1881. Shiller would argue that the average reading over the years is 16.4. I've argued in the past that, with a shift in investor attitudes starting in the 1950s, a more accurate average would be 19.6. But even by that measure, the market seems to be overvalued by about 20%. The second metric I look at is the sentiment survey conducted by the American Association of Individual Investors. Following Warren Buffett's dictum to be "fearful when others are greedy," I've shown that when the average bullish sentiment is over 50%, the market usually performs poorly over the following 12 months. Well, the most recent survey shows that about 46% of investors are bullish on the market's potential. Though that doesn't cross my 50% threshold, it's creeping perilously close to it. Are we monkeys with darts? Without any context, you might think I'd advise staying out of the market completely. But that's simply not the case; it's just that today, you really have to do your homework. Back in March of 2009 -- the market bottom of the Great Recession -- any monkey could have thrown a dart at random and hit an investment that made tons of money. The CAPE was at 13.3, and only 19% of investors were bullish on the market. Those are perfect conditions for obtaining outsized gains. Using the same logic, a dart-throwing monkey wouldn't do so well today. But I'd like to think that by looking at individual stocks, and not the broader market, we can still find great companies to invest in today -- and outperform our primate cousins. Even during tough economic times, companies that are leading the way to a better world are able to outperform their peers. Below are five stocks that I think are reasonably priced today, versus their potential over the next five to 10 years—and a quick explanation of why I think what I do. Westport Innovations (NAS: WPRT) Design engines that can run on natural gas Though it hasn't turned a profit, it's the leader in the design of natural-gas and dual-gas engines. The country's natural-gas conversion is just getting started. MAKO Surgical (NAS: MAKO) Robotic knee and hip replacement surgery With 10,000 baby-boomers turning 65 everyday who want to stay active, these procedures will become a must. Baidu (NAS: BIDU) Search engine of China Still only 37% of Chinese citizens have regular access to the Internet. As that number rises, the ads Baidu offers will become more valuable. Apple (NAS: AAPL) Really now? The growth here is mind-boggling. In its first week out, the new iPad sold 3 million units! Heckmann (NYS: HEK) Disposal of water used in fracking process Water disposal is one of the primary concerns with the fracking process that could provide a huge chunk of America's energy moving forward. Heckmann is out in front of this environmental trend. I'll be backing up my assertions by making a bullish CAPScall on all five of these companies in my All-Star profile. But let's be honest, there are likely far more than five stocks left out there that are underpriced on a long-term basis. Our top analysts have released a special free report that details other such stocks: "The Stocks Only the Smartest Investors Are Buying." Inside, you'll get the names of a bank stock that Warren Buffett might wish he could buy now but can't, given its size. However, you can if you get your copy of the report today, absolutely free. At the time this article was published Fool contributor Brian Stoffel owns shares of Apple, Westport, Baidu and MAKO. You can follow him on Twitter where he goes by TMFStoffel.The Motley Fool owns shares of MAKO Surgical, Apple, and Heckmann. Motley Fool newsletter services have recommended buying shares of MAKO Surgical, Baidu, Apple, and Westport Innovations. Motley Fool newsletter services have recommended creating a bull call spread position in Apple. Try any of our Foolish newsletter services free for 30 days. We Fools may not all hold the same opinions, but we all believe that considering a diverse range of insights makes us better investors. The Motley Fool has a disclosure policy.